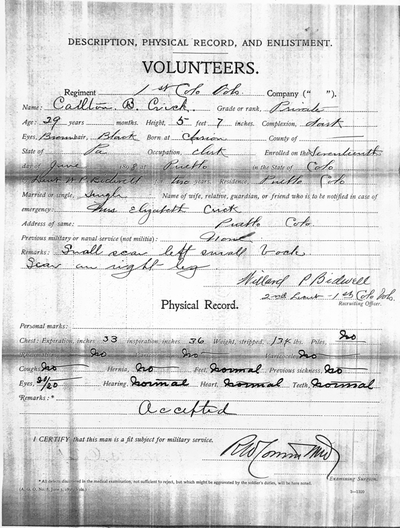 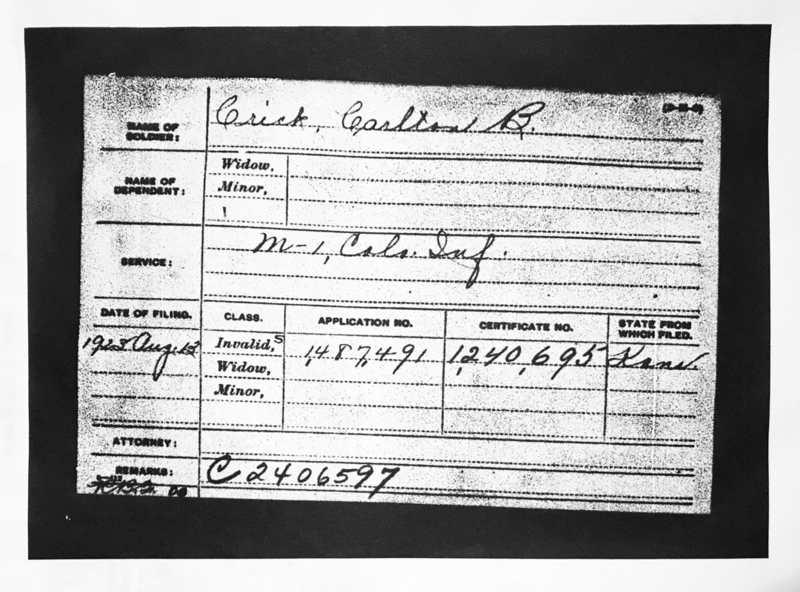 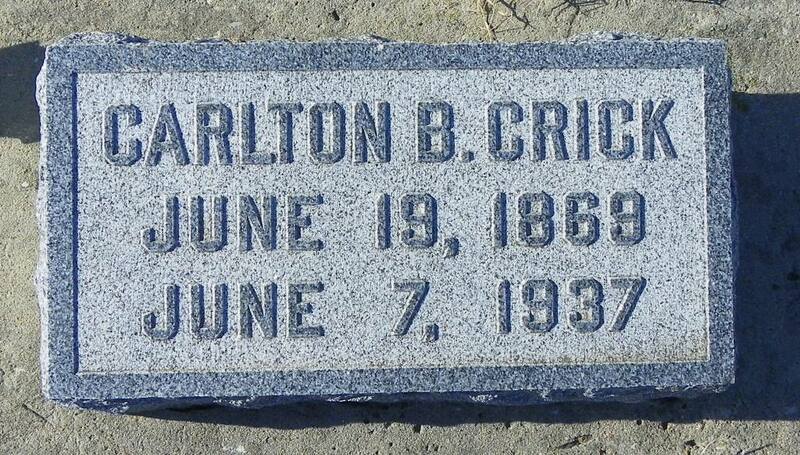 ​United States Army Private Carlton Burt Crick was born June 19th 1869 in Clarion, Pennsylvania. 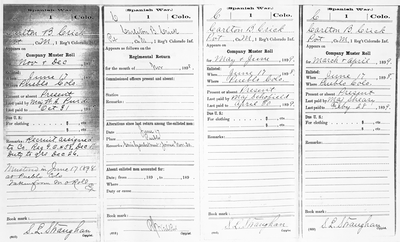 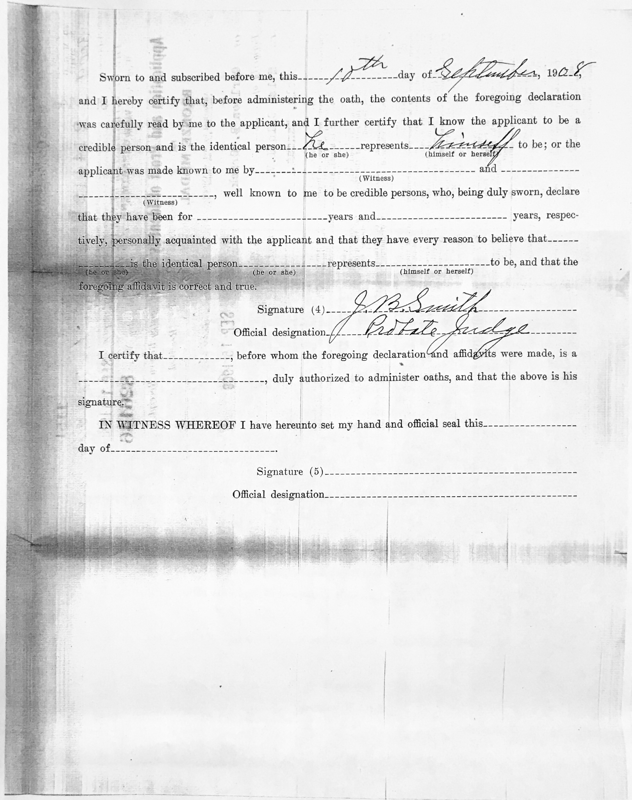 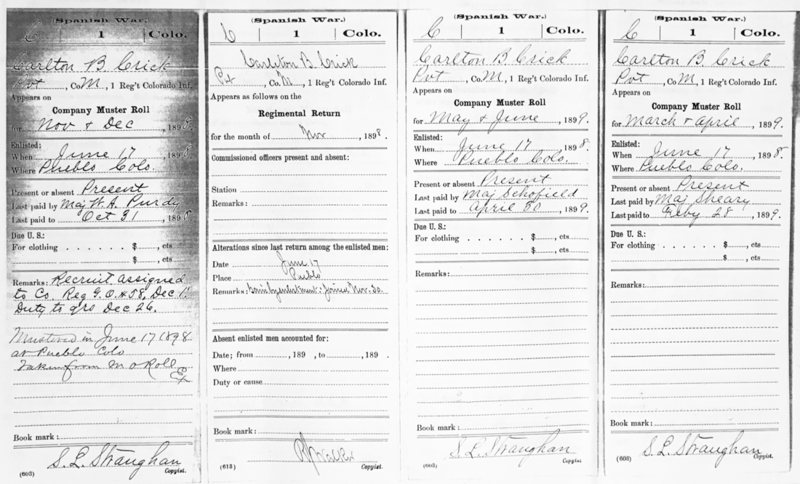 He moved to Colorado in the 1890's, where he worked as a clerk before the Spanish American War. 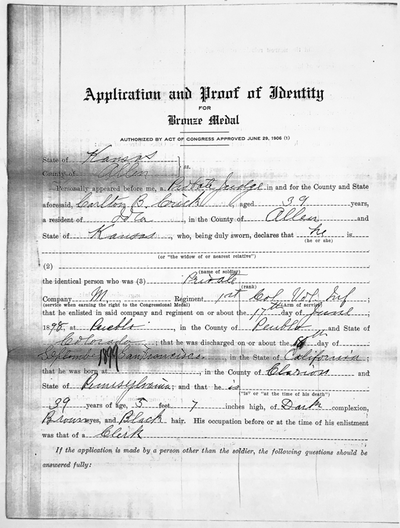 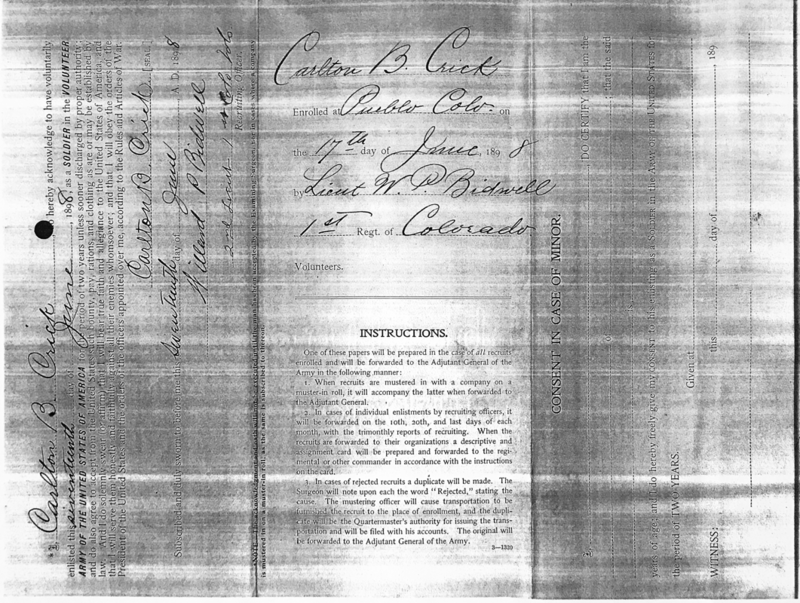 Carlton Mustered in June 17th 1898 in Pueblo, Colorado. Assigned to Co. M. 1st Colorado Infantry Regiment. 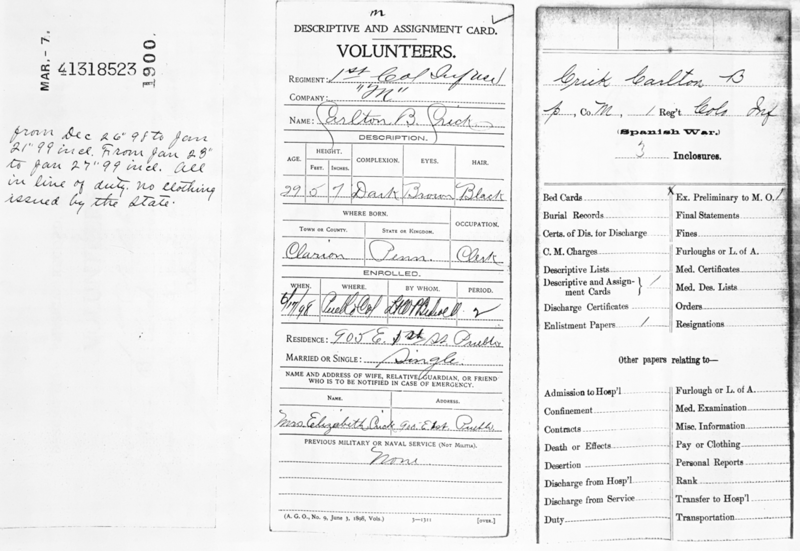 From the Presidio Fort, San Fransisco he was loaded onto the Army Transport ship Arizona on August 21st. 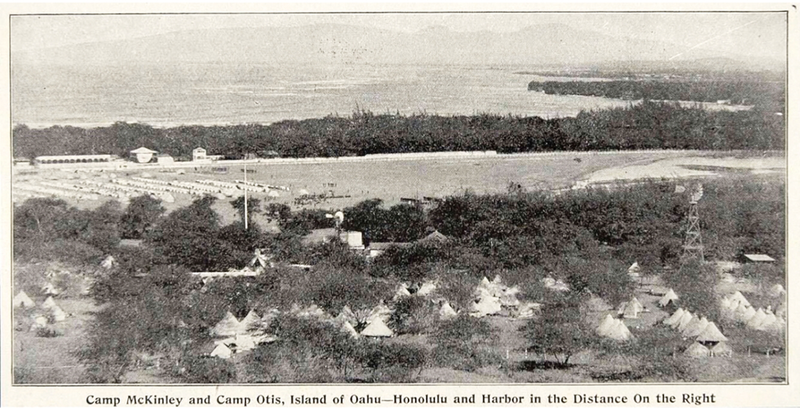 The uncertain course of military affairs caused the Regiment to be landed at Honolulu, where they were kept until November 10th, at Camp Otis, Honolulu, Hawaii before being taken on to Manila. 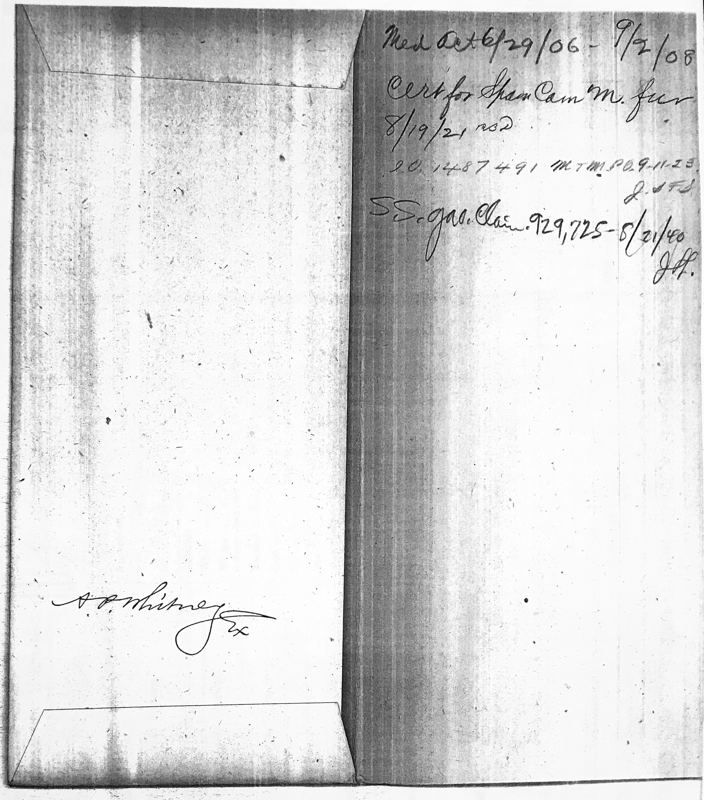 They arrived in Manila on November 23d, and were immediately assigned to their companies. 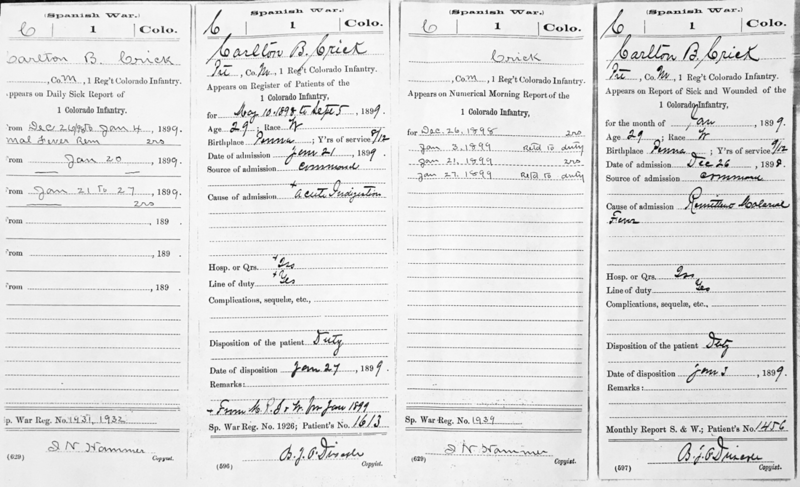 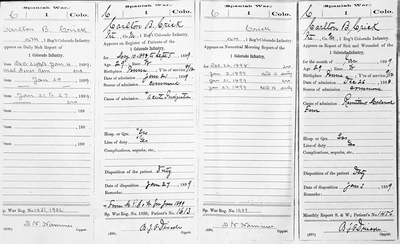 From Dec. 26th 1898 through Jan. 27th 1899 Private Crick was to sick for Duty & remained in quarters with acute indigestion & fever. 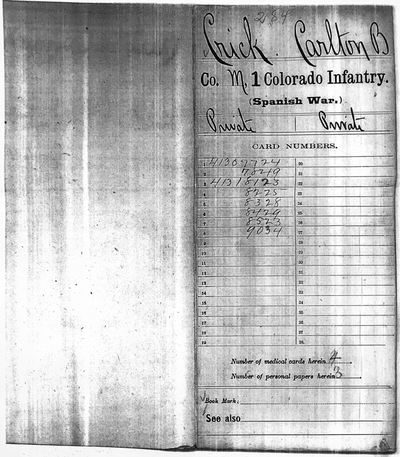 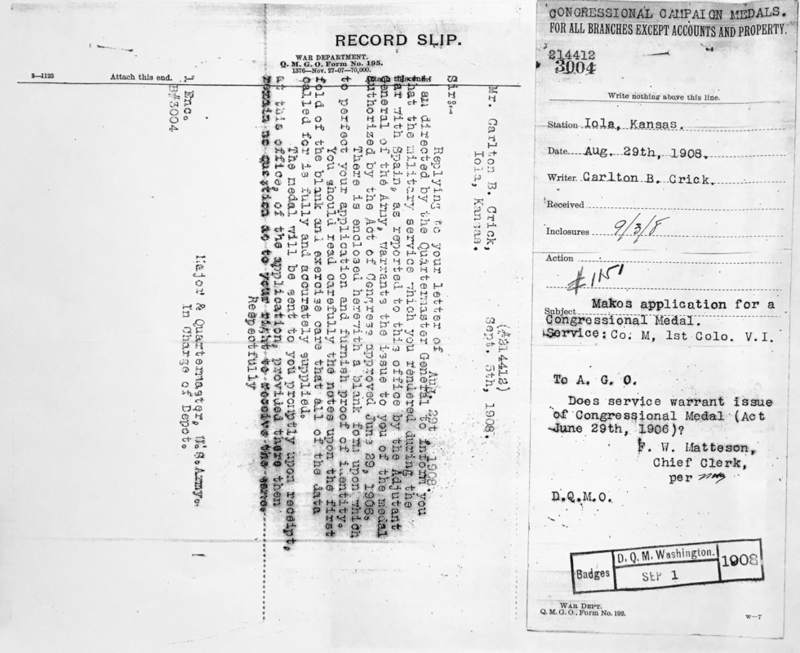 For several months afterward the duties of the Colorado 1st Infantry were not greatly hazardous, consisting of guard & outpost work, part of the time at Bilibid Prison. 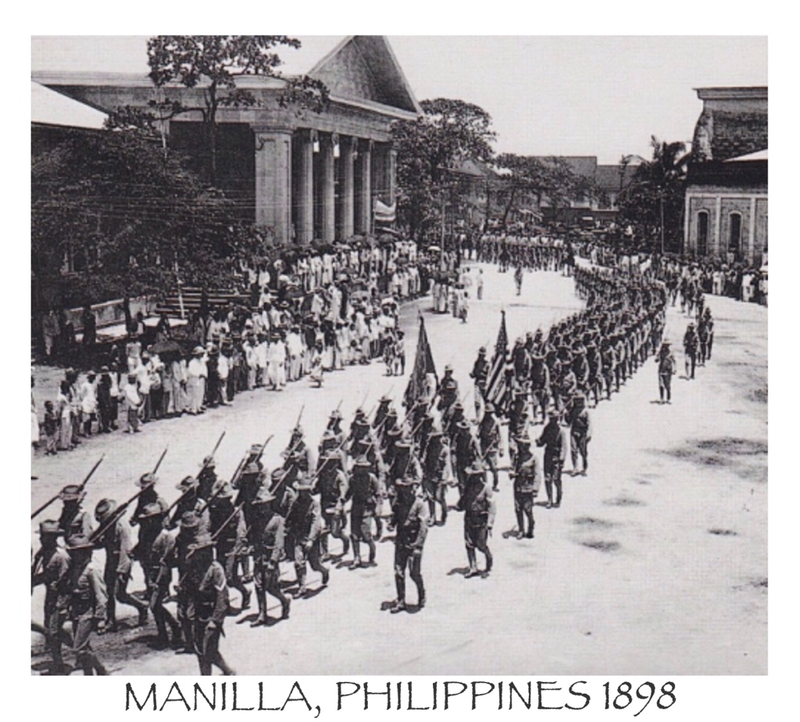 In February, 1899, the insurgents under Aguinaldo became troublesome and the 1st Colorado became part of the force which captured blockhouses 5 & 6, also participated in the recovery of the Manila water-reservoir, & the pumping-station. 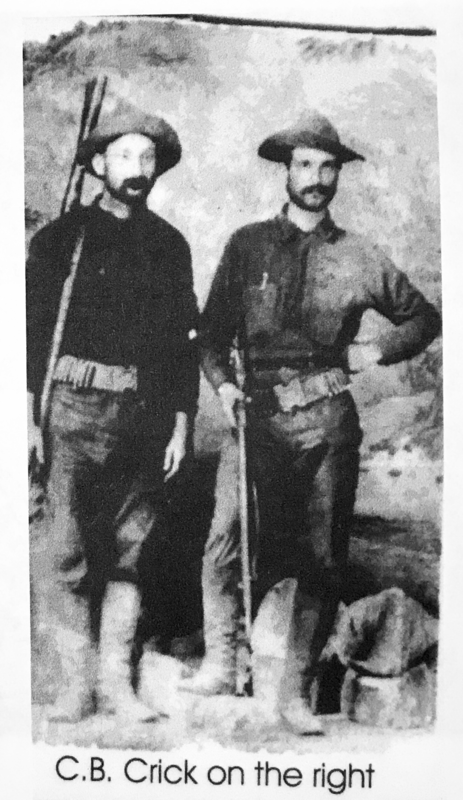 Until late in March the regiment then remained on guard at the pumping-station, with frequent small engagements with the natives who were conducting a guerrilla warfare. 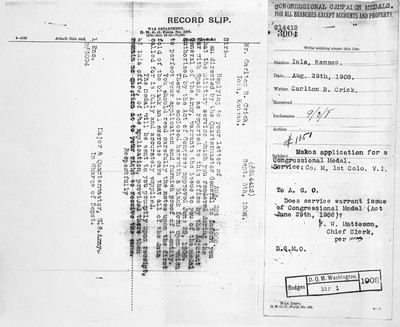 Companies A, M and a portion of E, under Lieutenant Colonel Moses, engaged in the advance toward Malolos on March 25th and fought bitterly with the insurgents during the entire day. 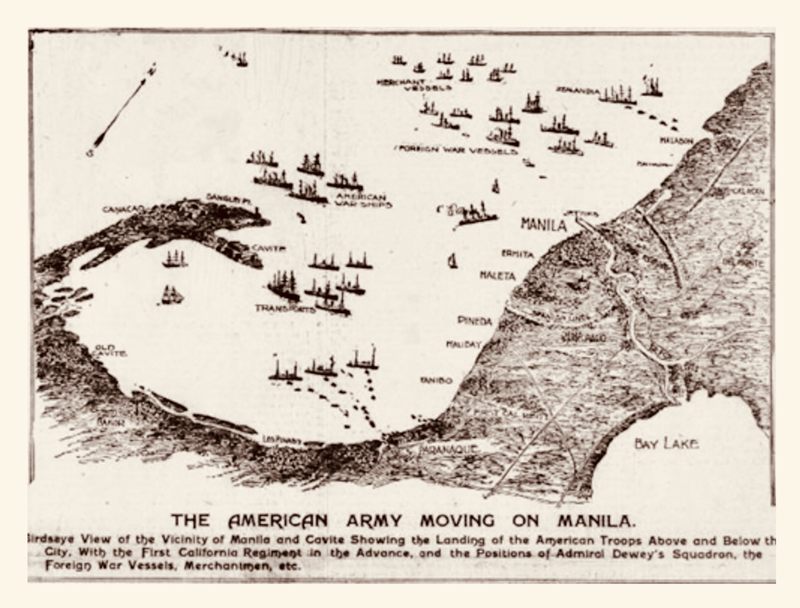 The next expedition, also under the command of the brave Lawton, in which Colorado troops engaged, was against a large force of Filipinos near Paranaque and Las Pinas. 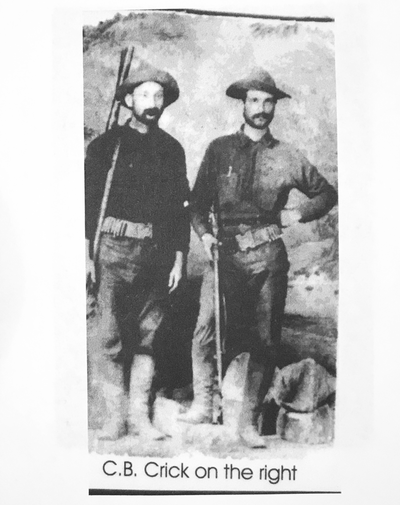 The American force, consisting of about five thousand men, was composed of regulars, with the exception of a troop of Nevada cavalry & Companies B, D, E, F, I & Private Crick with Co. M of the First Colorado under Colonel McCoy. 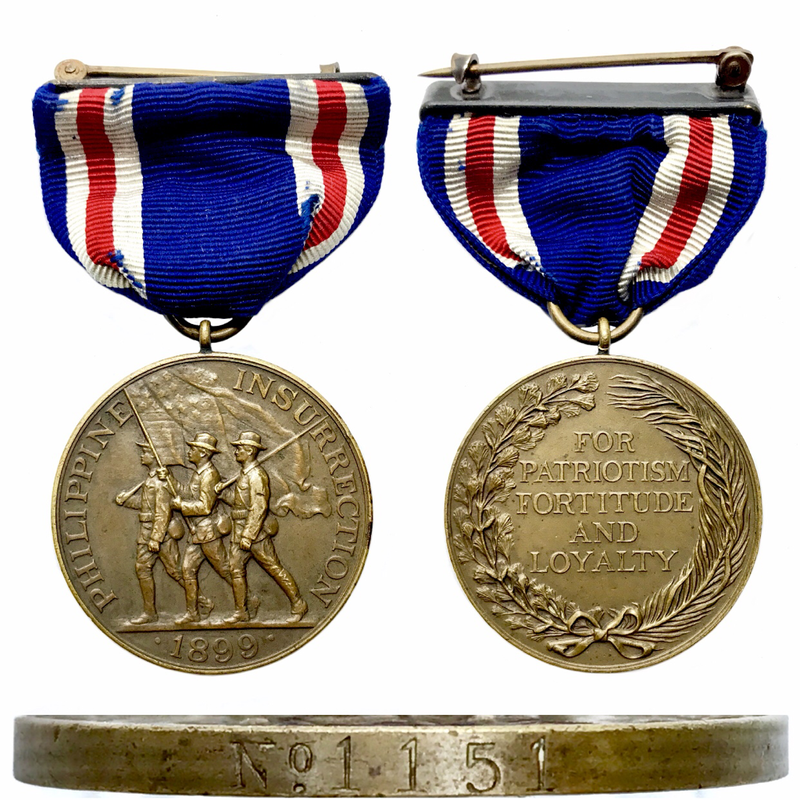 Several casualties were inflicted upon the First in the capture of Las Pinas, but during the whole of the fighting the Colorado soldiers bore a conspicuous part & received warm praise for their gallantry. This was the last active field service in which the Colorado men participated. 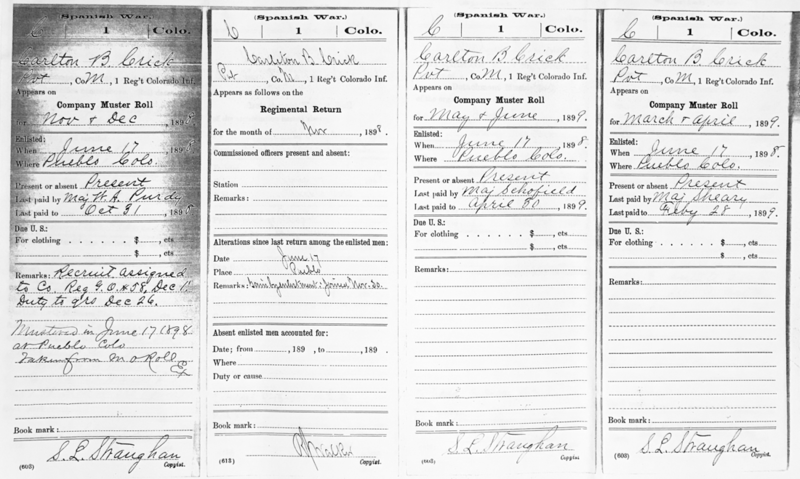 In late June while serving in Manila they were assigned to guard duty at the waterworks, where the greater portion of the regiment remained until departure for the states. 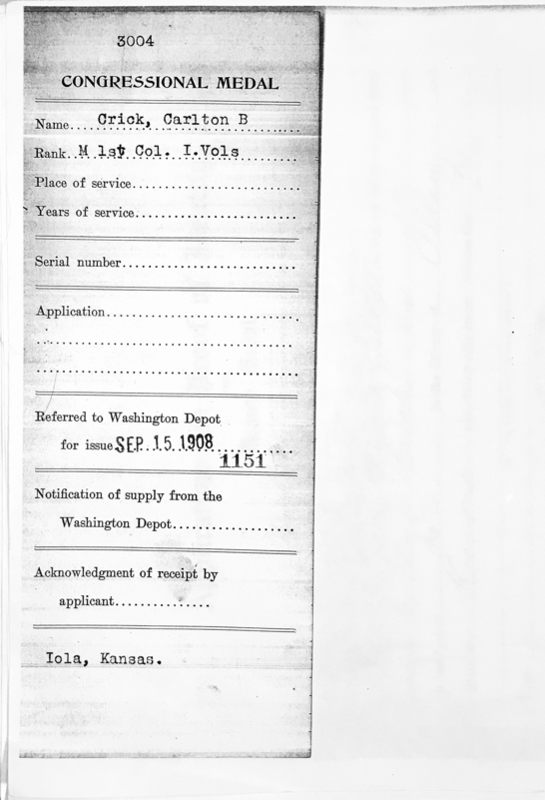 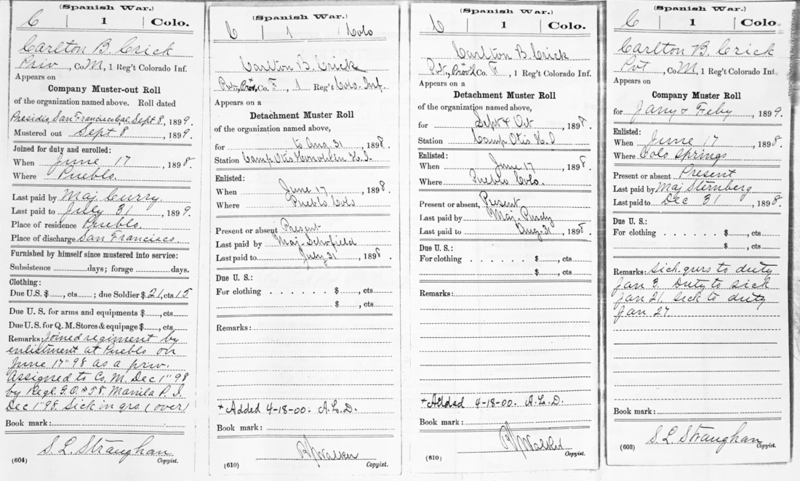 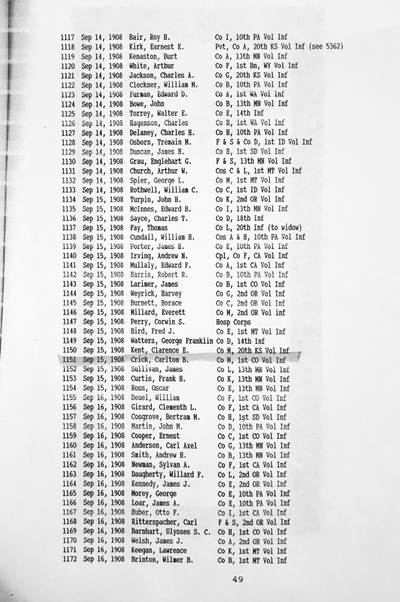 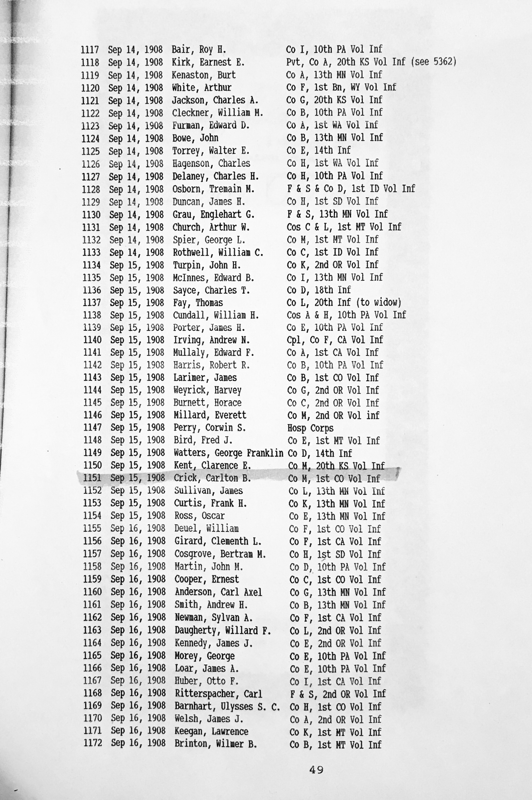 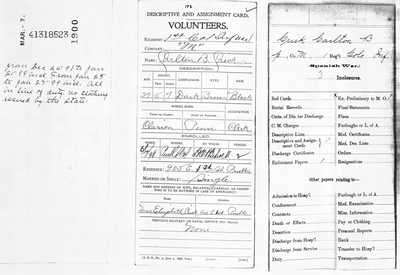 Orders for embarkation were received July 4th and on the next day camp at the waterworks was “struck.” On the 6th the regiment marched into the City of Manila, boarded the transport Warren on the 15th, and sailed on the 18th, just one year after the troops had arrived on Philippine soil. 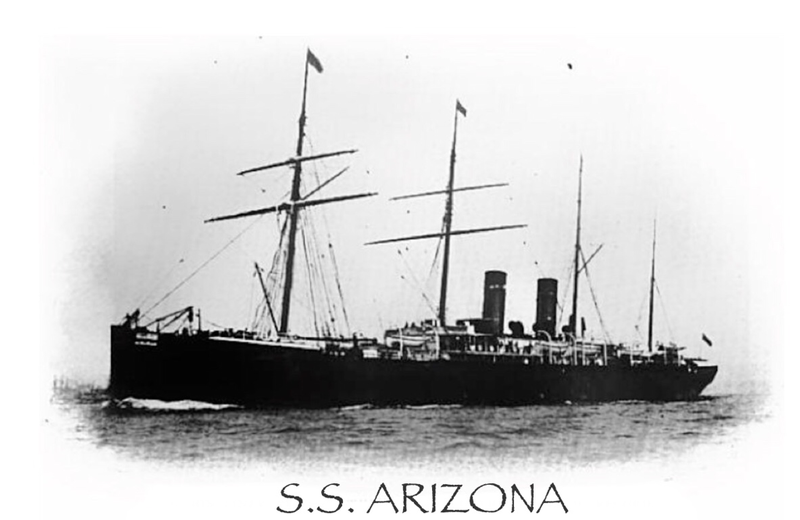 The transport stopped at Nagasaki and Yokohama, Japan, on the return voyage and arrived at San Francisco on August 16th, there to be met by Governor Charles S. Thomas, Adj. Gen. J. C. Overmeyer & other Colorado men of prominence. 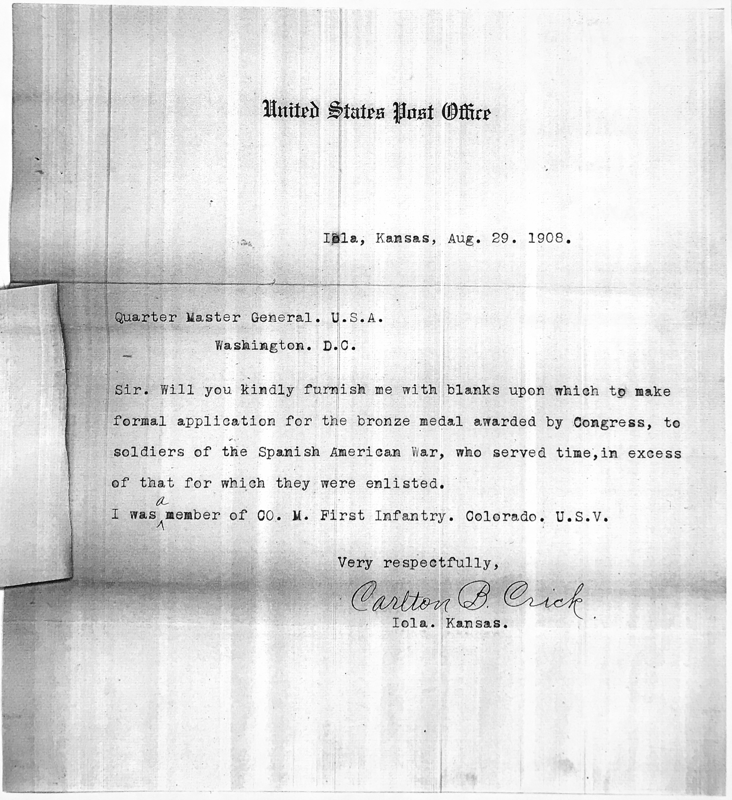 The Private Crick & the 1st Infantry regiment were mustered out at the Presidio, San Fransisco, CA. 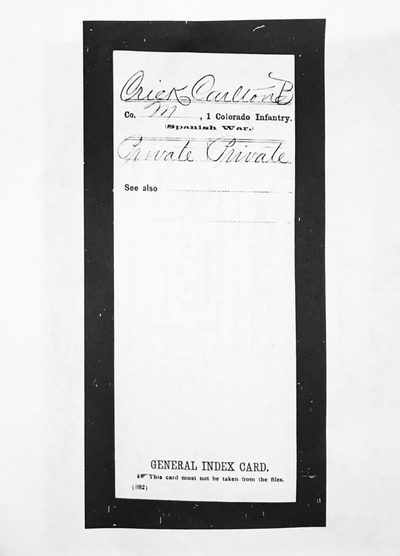 on September 8th and reached Denver on September 14th. 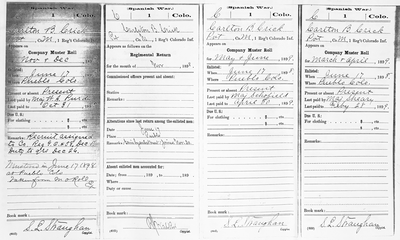 In their home city the men were greeted with a gigantic welcome. 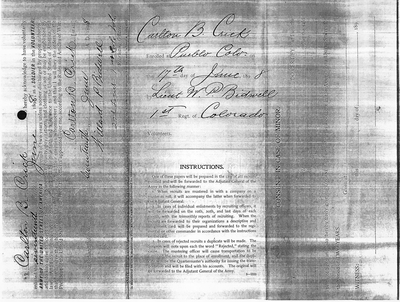 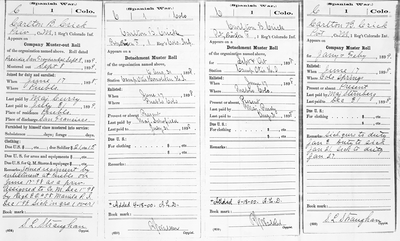 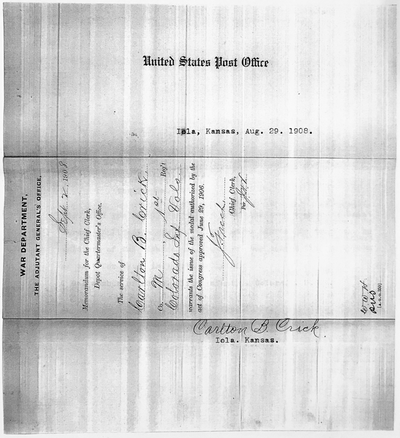 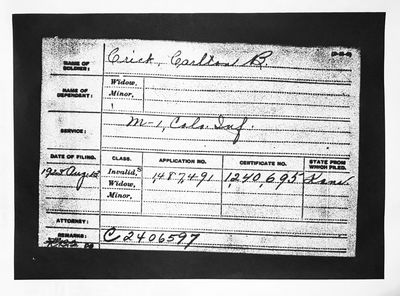 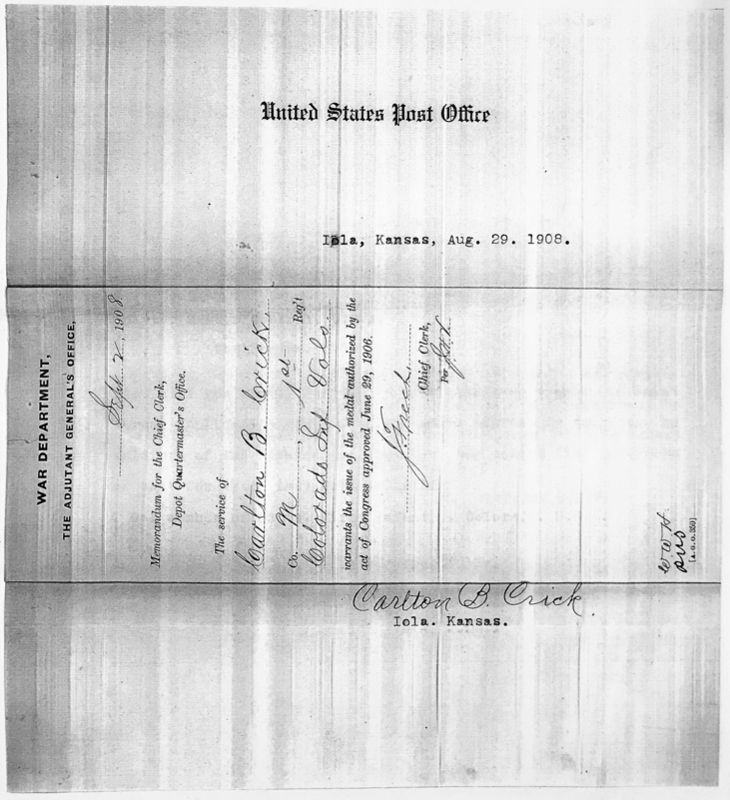 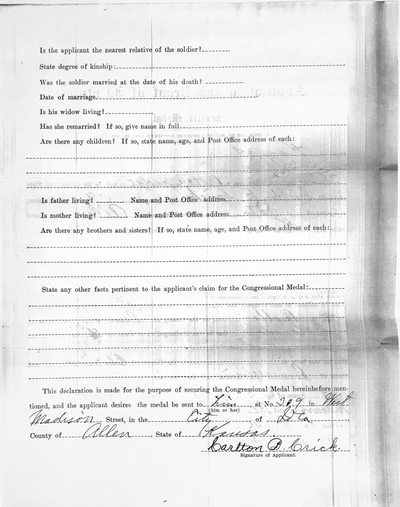 Mr. Crick moved to Iola, Kansas in 1903. 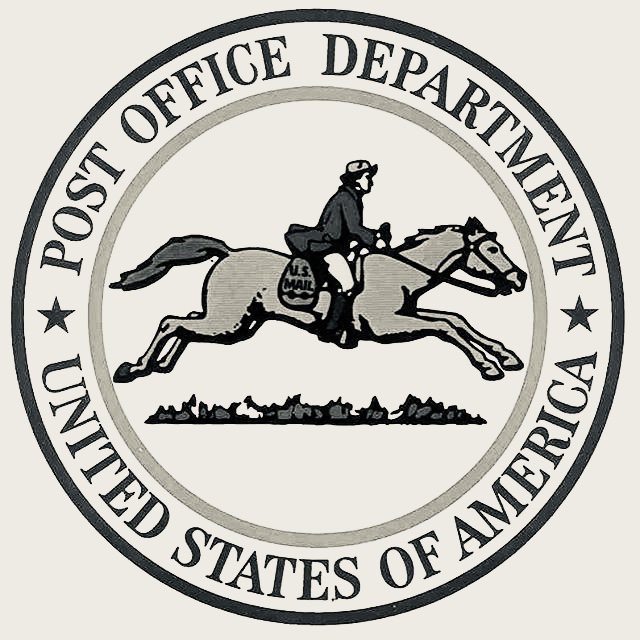 He started his civil service working as a United States Post Office employee. 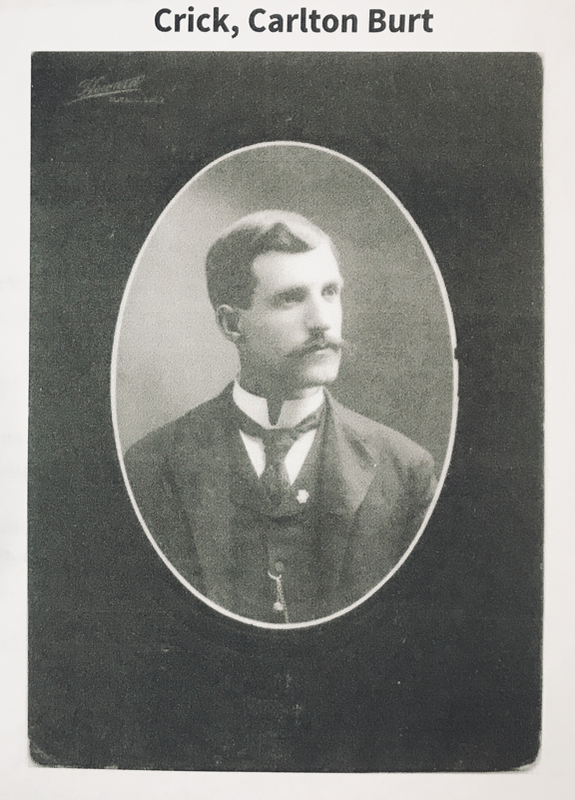 He was the Commander of his Local V.F.W. Post & former Finance Commissioner for the city of Iola, Kansas. 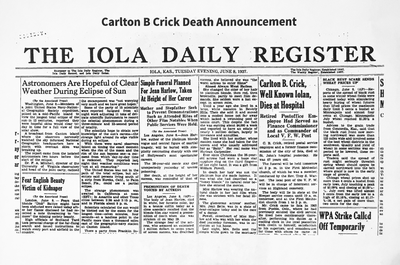 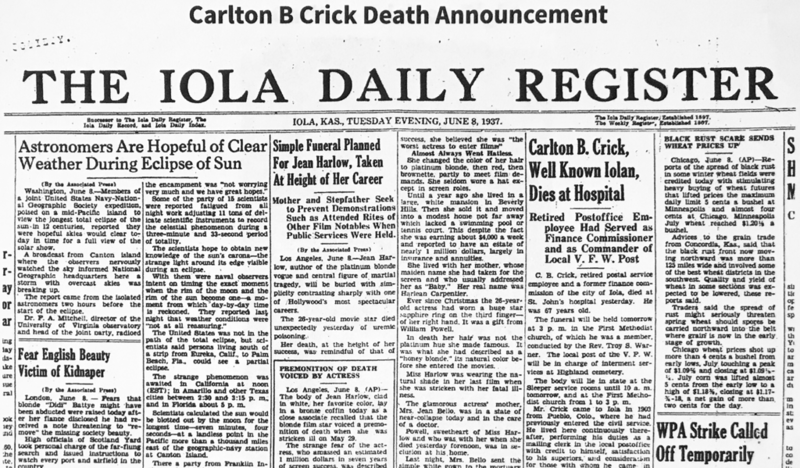 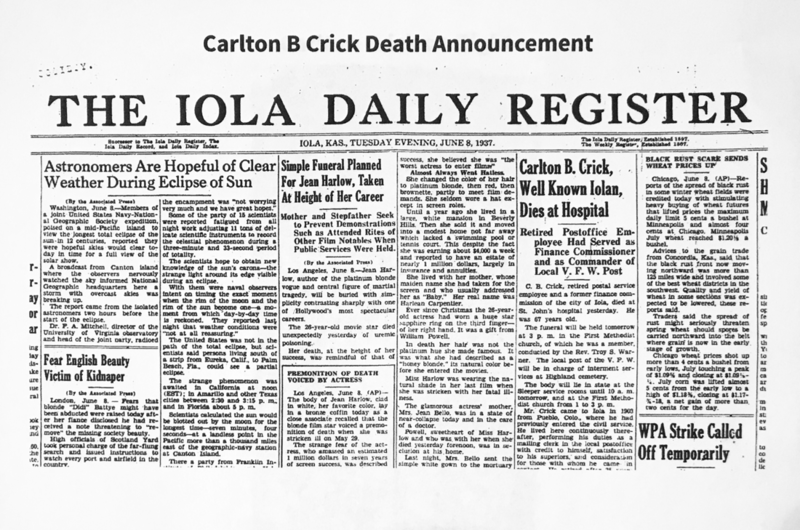 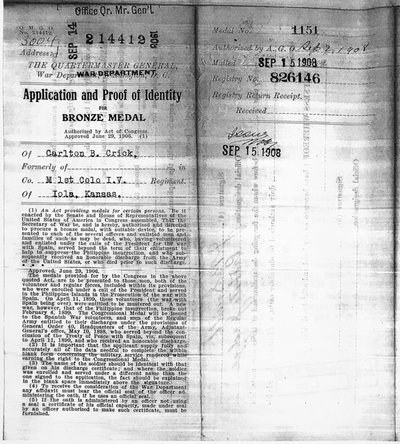 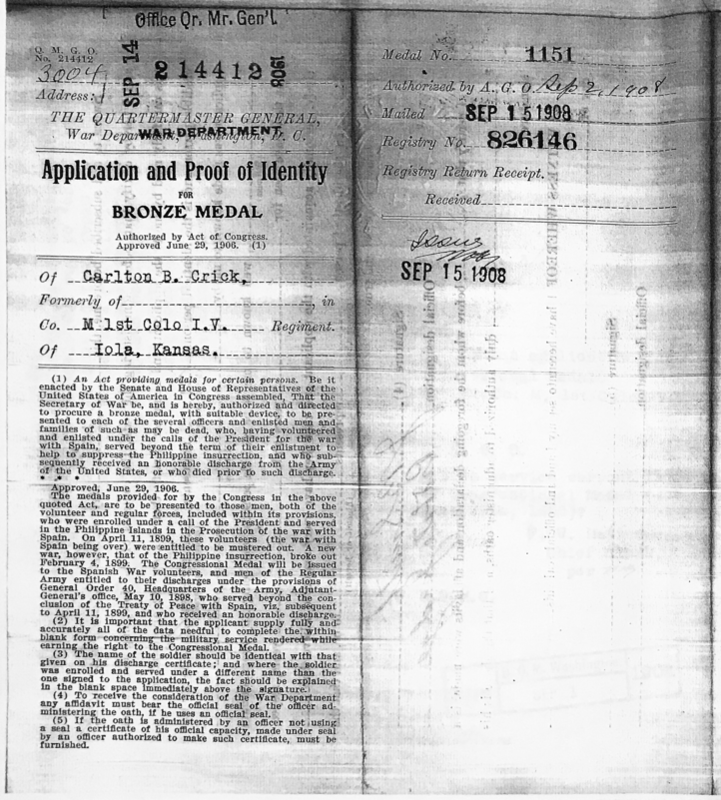 ​ United States Army Private Carlton Burt Crick passes away June 7th 1937 at St. John’s Hospital in Iola, Kansas. He is buried at Highland Cemetery, Iola, Allen County, Kansas.